Author Greg BenedictPosted on August 19, 2009 January 27, 2013 Categories ruby on rails3 Comments on Is Delayed Job :run_at => DateTime Giving You Fits? A lot of effort has been going into transforming IndyRB into a valuable group of talented people. We’re at 116 members and growing! We have a new website up at www.indyrb.org with all the details. We meetup the second Wednesday night of each month. Get updates, make suggestions and help out via @indyrb on Twitter. Join the back channel IRC conversation at irc://irc.freenode.net/indyrb. Scan the archives of our #indyrb IRC room. Quite a few of us hang out on IRC during the day and late at night. It’s a great way to see what some of the best Ruby developers are discussing and get some help when you’re stuck. One of the first recommendations from nearly every photographer I know was to buy a 50mm lens and just keep it on all the time. They said the f/1.8 was a great value, and i have to agree. It was the first lens I purchased and I paid around $85 on Amazon. Since we started hosting Ruby on Rails applications in 2006, many of the pieces have changed. At each step, things became a bit easier and a bit faster. Here’s how things have changed. Update: This position has been filled. Thanks! My company, TGFI, is currently looking for two full time Ruby developers with LAMP/CSS/XHTML experience in Indy. Even if it’s just a passion on the side, as long as the person has a solid web development background and is eager to learn, that will work. If you know anyone who is interested, please visit http://www.tgfi.net/2008/08/12/come-work-with-us/. Update: WordPress 2.5 has gone final. Great work from the teams at Auttomatic & Happy Cog, along with all of the contributors. The latest release candidate of WordPress, 2.5 RC2, is out. So far I haven’t noticed any major changes from RC1, just some tweaks based on feedback. Also, if you are going to upgrade to any release of 2.5, check out the official which plugins work and which don’t list before upgrading. Once you’re in the clear, go install. The admin tool is so much better. Yesterday I was working through my latest feed updates in Google Reader when I came across more information on the new WordPress 2.5 changes on Jeffery Zeldman’s blog. I kept it unread so I could come back to it later, but after what I saw, I kept thinking about it all day. Could it really be that good? Tonight I pulled a copy of the site down to my laptop and did a test upgrade. Everything checked out( themes and plugins), so I went for it on the live site. Don’t worry, I backed up first. I really enjoy the new editor – TinyMCE 3. Especially since it works correctly in Safari 3. I prefer Safari for its superior font rendering and speed, but I was relegated to Firefox under 2.3.3 and below. Hats off to the team at Happy Cog. They’ve done some great work here. For more details, Techosailor has a full write up on the changes that is worth a read. Also, Matt from WordPress notes this is production ready, but they wanted feedback on the design before finalizing 2.5. Don’t be scared of that RC1 name, go upgrade! mysql Ruby Gem install Issues — solved! I ran into an issue today installing the ruby mysql gem on a fresh Leopard system with 10.5.1 installed and the MySQL 5 package for Intel installed. This is based on Dan Benjamin’s great work. To keep this easy, here is the low down. What was happening was an issue with it expecting headers for PPC. PPC? What the??? I’m on intel damn it! Author Greg BenedictPosted on February 21, 2008 March 31, 2009 Categories apple, rubyTags leopard, mysql, osx, ruby, ruby gems5 Comments on mysql Ruby Gem install Issues — solved! The MacPorts funding bill is passed. The system goes online on February 20th, 2008. Human decisions are removed from strategic installation. MacPorts begins to learn at a geometric rate. It becomes self-aware at 3:03pm Eastern time, February 21st. In a panic, they try to pull the plug. 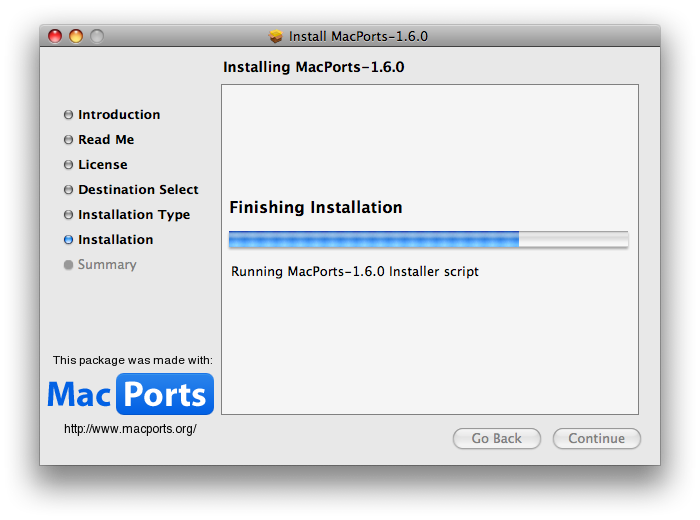 And, MacPorts installs itself.